The Jerusalem Family Court (Judge Ben Zion Greenberger) has reportedly ordered a husband who refused to give his wife a divorce for nine years to pay damages of approximately $160,000. In an unprecedented ruling, the judge said that even if a husband is not required by the court to give his wife a divorce, he will still compensate her for his refusal on the matter. 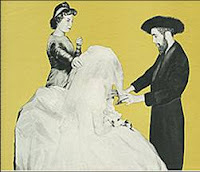 The plaintiff is an ultra-Orthodox woman who began the proceedings towards a divorce in 1998. She claimed that she had been physically abused by her husband and forced to flee her home with three children. The case went to the High Rabbinical Court, which ruled that the husband must give her a divorce. The husband did not do so and the woman appealed to the Family Court, demanding compensation for the distress her husband had caused her over the years, and for the denial of her right to marry again and continue with her life. Previously, courts had ruled that damages should be paid from the time the divorce is finalized. The new ruling allows the wife to sue for damages for all the years in which her husband refused to give her a divorce, including the years her lawsuit is pending in court. The woman’s lawyer hailed the ruling: "It would seem that the civil courts have finally begun to realize that the rabbinical courts take too long in enforcing divorces, and have decided to treat the women justly."